The state parks department has been planning for years to build a paddlers’ access on the Luckiamute River in Polk County, and maybe this is the year it finally gets done. In the meantime, though, boaters do have a way to get their small craft in the water, as the video shows. The improved access has always been part of the plans for the Luckiamute State Natural Area, now apparently called the Luckiamute State Park. Where the river access is planned off Buena Vista Road, a parking lot and restroom were put in a couple of years ago, but the launch itself proved a problem. Last year, construction was postponed again because the planned floating dock would have to be removed every winter, and this called for a new and special design. As I was leaving, a pickup arrived with a kayak on top. Evidently these guys would not be stopped by the lack of an approved ramp or floating dock. I asked them if they minded me watching them launch and taking some pictures. They didn’t mind, and the video is the result. 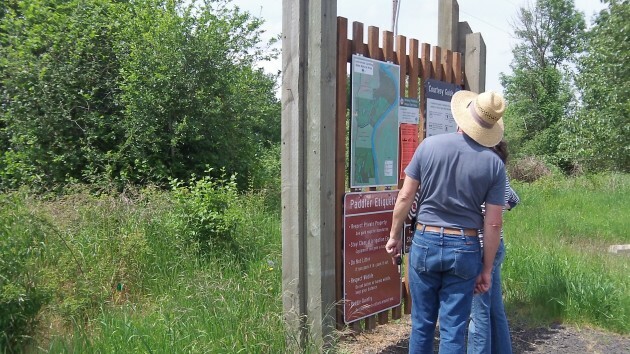 Visitors study the map of the Luckiamute Natural Area at the paddlers’ access parking lot. 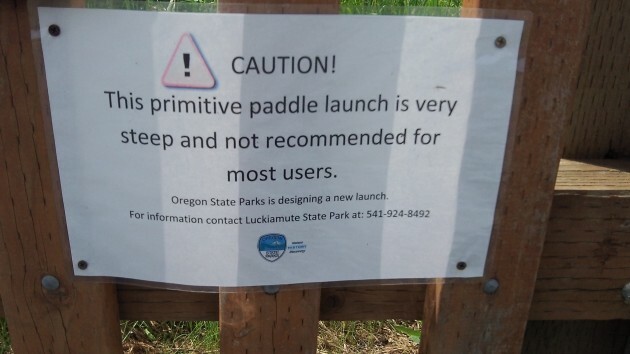 As long as they are in the area working on this launch, they should take some time to do some maintenance on the Luckiamute Landing trail. The west leg of the path (that follows the river) has had a downed power pole blocking it for months. It is posted as closed, but it still gets regular use, as a diversion path has spontaneously formed around the blockage.